Milani has a ton of new items out for Spring 2012, but this is one of my favorites. It's called Milani Illuminating Face Powder, and I'm sure you've already seen it, but if not, please allow me to show it to you because it's too pretty to miss! 01 Amber Nectar, which is a mixture of light neutral brown, silvery taupe, warm rosy brown, warm coral pink and shimmery ivory cream. 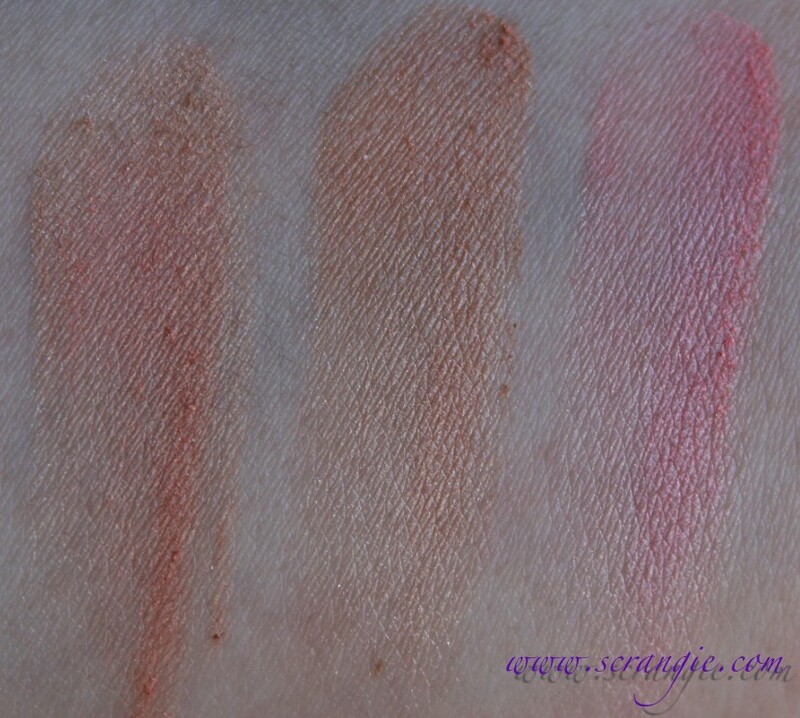 02 Hermosa Rose, which has medium brown, lighter warm brown, rosy light brown, and a golden cream shimmer. And 03 Beauty's Touch, which has deep coral pink, medium rose pink, pale peachy pink, light cool pink and shimmery ivory cream. The back label has the shade name, weight and ingredients (underneath the top label with the name), but it also includes a diagram on how to use the product. 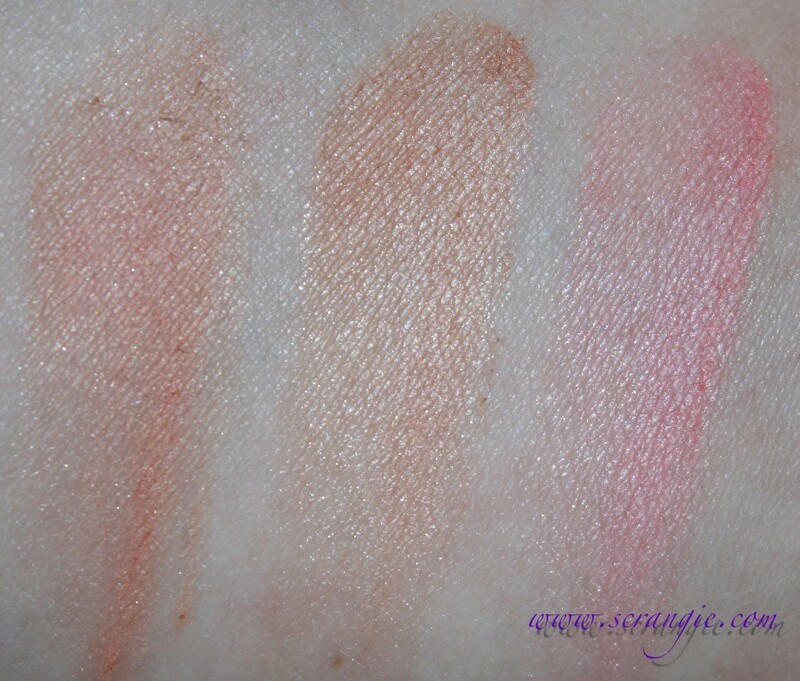 All shades blended, no primer, with flash and natural light: Amber Nectar, Hermosa Rose, Beauty's Touch. 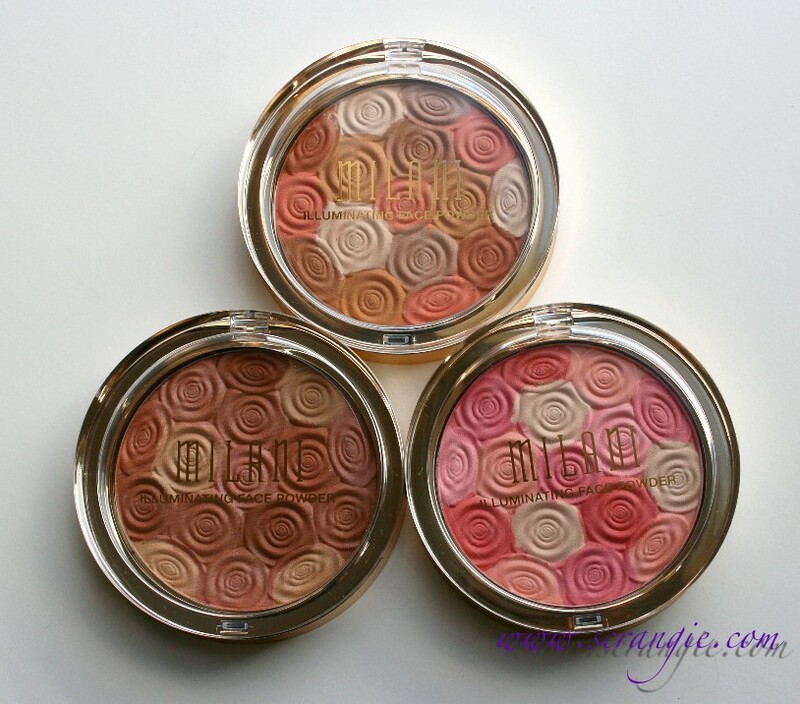 I've been using them as a blush and I really, really like them. 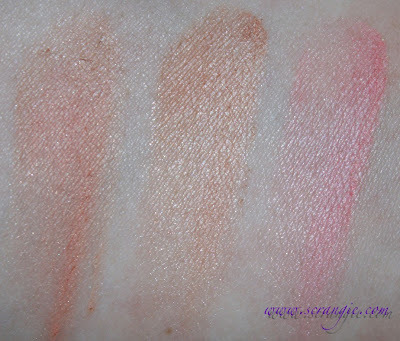 They seem shimmery in the pan, but once you've blended them onto your skin, the shimmer is more of a subtle (not sparkly or shiny) glow that gives a really soft, radiant look. It's not "illuminating" in the sense that it's a white-based frosty, shiny type of highlighter powder, but the lighter shimmer shade mixed into each one of these does bring a lot of light to the areas where they're applied without adding glitter or frost. All three colors work on my skintone. The amber and brown ones are not orangey or muddy and the pink doesn't make me look sunburned. No glitter or excessive frosty shimmer like a lot of highlighters have. Can be used as blush or highlighter. You can pick out the individual shades to use as blush, bronzer, highlighter or eyeshadow if you have a nice, small brush. Gorgeous design. Looks too pretty to be drugstore! Sheer color that's easy to build and blend, good for someone like me who's not very skilled at applying super pigmented blushes. Inexpensive for how nice they are; $9.49 online from Milani. 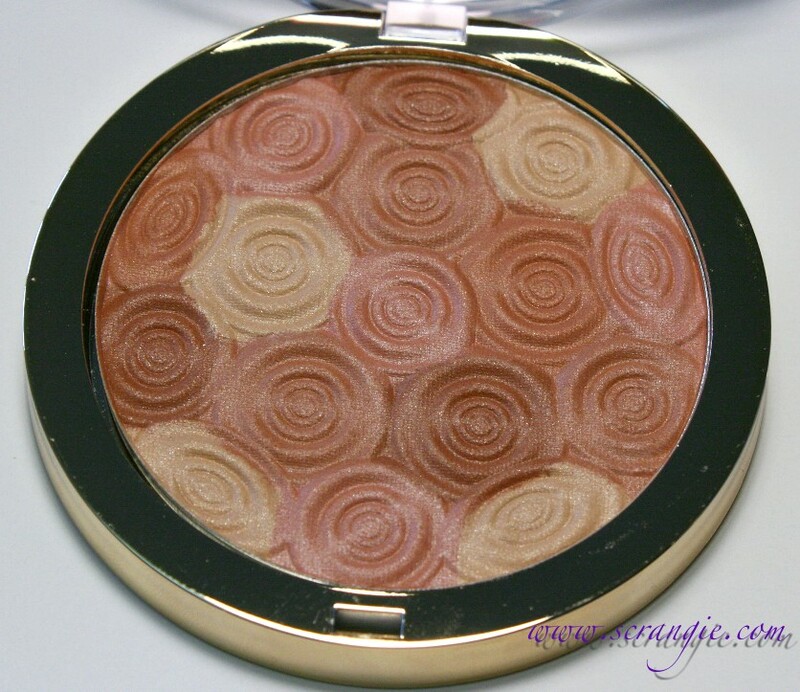 Gives a bright, glowy look, not a shiny look- I hate having shiny cheeks! The design doesn't get ruined after use. I've used these each quite a few times and the design is still pretty. There's too much color in these for me to use them as an all-over illuminating powder as recommended. Seems to fade after a few hours, not as long-lasting as I'd hoped. Gold palette attracts fingerprints and can get scuffed if you carry it in your purse. Overall, I think these are really nice, especially for drugstore. They're incredibly cute to look at, but they actually work really nicely as bronzer and blush with subtle illuminating effect so they aren't just all looks and no performance. I appreciate that they aren't majorly shimmery and glittery because I don't like how super shimmery products look on my cheeks. These don't come with a brush like a lot of Milani's face products do, but that's okay because the brushes are usually not that great and the compartment that stores them makes the palette bulky. I really like these and I'd definitely buy these again, especially at under $10 a piece. They feel like quality higher than drugstore, so I'm actually a little surprised that they're only $9.50! I am such a sucker for pretty packaging.. These are too pretty to use!!! I have Hermosa Rose and just love to look at it, it's so pretty! 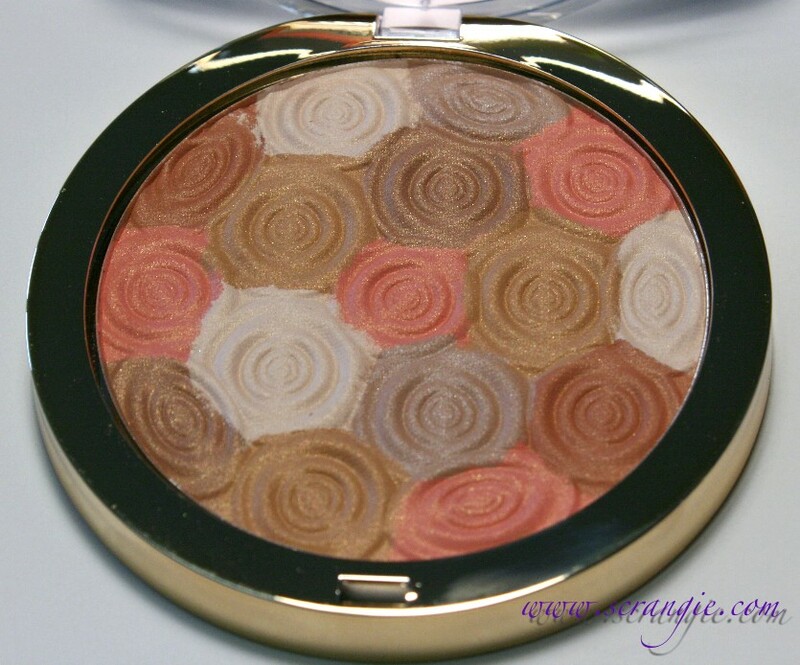 The color is nice and more natural looking than using bronzer as a blusher color. The one thing I can't stand, though, is the smell. I don't know what I think it smells like, but it's not good. Do yours have any kind of scent to them? Haha, unfortunately, I am not one of those people! At least it's not too strong on mine. Oh these look nice! Milani has really stepped up their game in terms of makeup. I'm going to have to keep an eye out for these! I've been really impressed with some of their stuff- especially their Liquif'Eye eyeliners, which are amazing. You're right, they are super cute to look at :-)And it's good to know that these are not with tons of shimmer. Hi Tuli! How are you? I don't think I've seen you around in a while! I heard a less than stellar review on these by Emily Noel 83 on YouTube, so now I'm uber conflicted because your reviews are like my 'holy grails' but then again, I love Emily's reviews too!! I have to admit, these look fantastic in the pan though... Mmmmm. I love Milani nail polishes, so if the Polish Queen likes these, I'll be sure to try them! I like how accessible Milani is, and the price is always right. They have the best eyeliners! I've been crazy about these for some time now. 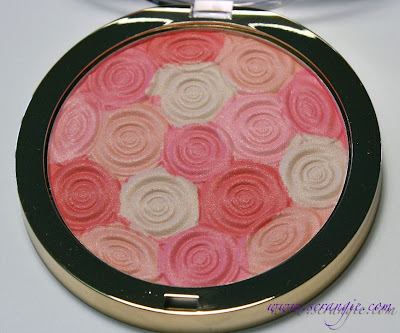 I seriously LOVE Hermosa Rose. I use it on my temples and stuff to make me look like I actually go out in the Sun hahaha! Yay! I think Amber Nectar is my top favorite, but Hermosa Rose might be changing my mind..
Did you have trouble getting them open? I swear, I cannot for the life of me easily get the lid to open. I use amber nectar as a cheekbone highlighter and I could not be happier. Holy grail status for me. I have super oily skin and use a powder foundation to help combat that. I don't like the powdery look it gives me for the first 4 hours or so of the day until my oils soften the powderiness so I started using highlighters to combat that. Most highliters I've tried look really shimmery and nice until my oil comes out. Then I look like a darn disco ball all shiny and glittery. This looks glowy and radiant when I put it on in the morning and slowly fades as my oil comes out so I'm never left with the disco effect. 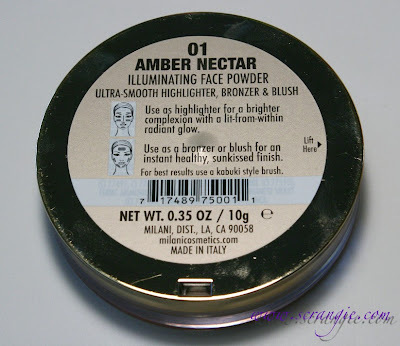 Around 1 or 2 I'll repowder and add a bit more amber nectar and I have gorgeous skin. If your oily and struggle with highlighters I would definitely reccomend this.